Shows current target threat value as status bar and threat list. Threat can be shown on nameplates as changed health color. 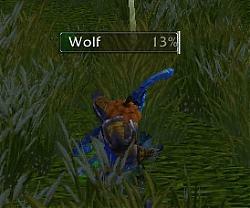 Also shows threat percent (optional), current tank name (optional), highest pet/party/raid member's threat as spark. "Securely tanking" state shown as StatusBar border. Simple and lightweight. Settings available via slash handler /ti or /threatindicator in chat. Set "positioning mode" in settings to drag bar. This mode auto-cleans on entering combat. Ability to keep StatusBar and/or List always visible. Ability to create default settings and spread to alts. Threat also visible on nameplates as changed health color (currently purple since red, green and yellow occupied by normal colors). Optional. Mouse dead zone fixed under StatusBar. "AllInOne" option to show tank name and threat percent inside StatusBar. "Securely tanking" icon replaced to border around bar when server return "securely tanking" status for tank. "Threat can be shown on nameplates as changed health color"
See message below. v2.26 uploaded, approval takes from minutes to hours. If you can't wait fix is "if td.threatColors and td.threatColors[id] then" at line 494 (I'm using Notepad++ to edit). There is nothing special in v2.25 except ability to create default settings and apply it to your alts. tooltip = "Select low threat color"
There is bug in v2.25 at line 494 on attempt to see "Defaults" page (should be "if td.threatColors and td.threatColors[id] then"). Fixed v2.26 uploaded. Thanks, guess it happened with empty settings only. Fixed in 1.35. As well as colors "default" and "cancel" on settings page. Main idea was to create addon as small as possible with most useful info. I don't like browsing my screen for Blizzard threat, searching Omen list for my own char or interpreting digital text values during Boss fight. Because Boss requires too much attention himself. If you want to add this support you can do that (if I understand WoWInterface rules properly you can add mod and I set "Allow Updates & AddOns" to "yes"). Oh I guess it happens with pet. Fixed. Will appears as soon as WoWInterface will approve it. Looks great, just what I was looking for, going to try it out now.